The great Roger Federer has advanced to his second consecutive tournament final with a 76(5) 76(6) win over Juan Martin del Potro. Federer now has 4 straight wins over del Potro and has won the past 9 sets. It is Roger's seventh Dubai final in his illustrious career: he won in 2003 (def. Jiri Novak), 2004 (def. Feliciano Lopez), 2005 (def. Ivan Ljubicic), and 2007 (def. Mikhail Youzhny). His other two final appearances were in 2006 and 2011 when he lost to Rafael Nadal and Novak Djokovic. The match was very evenly contested with both men holding serve with relative ease. Neither player was broken en route to two tiebreak sets. In the first set tiebreaker, Federer went up 6-2 before del Potro pushed back to make it 6-5. On Roger's final set point, he put away a forehand winner to take the set. In the 2nd set tiebreaker, Roger quickly got down 5-0 after letting some points slip away. He got the next two points on his own serve but Delpo won the next one to take a commanding 6-2 advantage. One would normally think that there would be no possible way that Federer could win the set, but never say never in tennis. Fed won the next three points to put himself in the same position that del Potro had in the first set; 6-5 down with the opponent to serve the final set point. Del Potro could not save that final set point in the first set, but Roger could. After the change of ends at 6-6, the best point of the tournament was played: a highly dramatic, very intense 29-shot rally that had Federer pushed from side to side, hitting many pressured backhands until the big Argentine finally clipped the net with a backhand and the ball bounced back on his side. Roger closed out the match on the next point to advance to the final. Statistically speaking, it was yet another solid performance from Federer. He served at 61% with 11 aces and 89% of points won off the first serve. He had six break point opportunities in which he could not capitalize but that is a combination of his own faults and del Potro's stellar big point play. The Maestro also won 62% of his second serves, a sign that he is also playing very well from the ground. Throughout the entire week, Roger has been hitting his second serve very well, with great depth, placement, and variety. Thanks to his efficient second ball, it allows him to win more free points than he usually would, and it gives him the confidence to hit the ball with authority off the ground as he is very seldom getting pushed back upon the return shooting back at him. It is well-known in tennis that serving well is usually very important to winning matches, especially against the best players, and Fed has shown tremendous skill with his serve the entire week. This bodes very well for him because when he is serving well, the rest of his game follows suit and he can open up his shoulders a little more freely. Overall, it was a great, serve-dominated match with two fun, dramatic tiebreakers. Coming back from 6-2 down in the 2nd set breaker to win six straight points should give Fed some great confidence heading into the final. It was very reminiscent of the Wimbledon final in 2009 when Fed came back from 6-2 down as well to rack up six straight points and take that pivotal second set that could have conceivably won Andy Roddick the match. In the first semifinal of the day, Novak Djokovic, the champion of the last three years in Dubai, lost to #3 seed and World #4 Andy Murray 62 75, in a rematch of their great Australian Open semifinal match a month ago. The first four games were even, with both players trading holds, but then Murray reeled off four straight games to take the set 6-2. Djokovic was not looking like his supreme self; he was shaky from the baseline and Murray was brilliant to take his time away. The second set started with Andy roaring out to a 3-0 lead and the #1 player in the world looking unmotivated and unusually dejected. After Nole got on the board at 3-1, the two men traded service holds until Murray was serving for the match at 5-3. Then, Novak broke, and he finally showed some signs of life. He got back to 5-5, but that is as far as he would get as he was broken at 5-6 to lose the set and thus the match. On the scoreboard, 62 75 looks better than 62 63, which is what it should have been. However, this was a very thorough victory from the Scot. He played with aggression on the serve and from the back of the court. He played the kind of tennis that is needed for him to break through at the Grand Slam level. It was a masterful win and you have to credit Murray for coming through in such a big match after a devastating loss at the Australian Open to the same man. After a very shaky start in the opening round, Murray has looked better and better with each passing match and looks to be in great form heading into the final against Federer. So there you have it, the Dubai final, Roger Federer vs Andy Murray. I would like to note that I predicted this final match-up, so I win! The match should be very compelling. Federer and Murray play very technical against one another, with Murray trying to attack the Federer backhand and Federer trying to attack the consistent Murray defense. I have no doubt that we will see many cat-and-mouse exchanges as both guys will look to utilize drop shots, angles, slices, and any other form of shot making that will give them the edge. It is worth noting that all 14 of their matches have been played on a hardcourt, which is absolutely amazing. Murray has the 8-6 advantage in the head-to-head, but that is meaningless right now as they have not played since the end of 2010 in the World Tour Finals. I will say, however, that many of Murray's victories have come with Federer not at his best; Masters Cup 2008 when Fed had a back injury (and still nearly won), Indian Wells 2009 when Fed was in a confidence crisis, Toronto 2010 after a tough Wimbledon defeat and a tough week in Toronto, and Shanghai 2010 after the tough US Open loss to Djokovic, where he struggled mightily. In the times when Federer has played well against Murray, he has won; the US Open 2008 final, the Cincinnati 2009 semifinal, the Australian Open 2010 final, and the World Tour Finals in 2009 and 2010. For much of his career, Murray has been criticized for playing too defensively in the important matches against the top players. 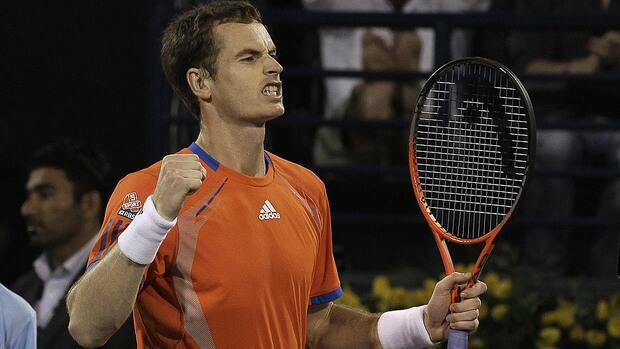 This week in Dubai, however, Andy has made the attempt to play much more aggressively and it has paid off. His serve is as good as ever and he is actually taking the initiative to attack and go after his shots in the rallies. That mindset certainly helped him defeat Djokovic and he will need to do the same if he wants to walk away with the title. For Federer, he has served magnificently all week long. He has not been broken at all and has played his past three matches without facing a break point, and even more impressively, he hasn't even been to deuce in his past three wins. Against Murray, who is a great returner, Roger will need to serve with the same ability that he has shown thus far, and that includes hitting great second serves. Because Murray is such a great returner though, it would probably be in his best interests to have a high first serve percentage, and with the way he is serving he is certainly capable of that. Overall, it should be a great final to cap off a great week in Dubai. Both Federer and Murray are playing at a very high level which should make for some great tennis and some great points. I give the edge to Federer because of the way he has been serving and backing up his serve with sharp baseline play. He will need to return much better than he has all week, but I believe he can and will do so. There is also the factor that Roger will be heading into the final coming off a hard-fought semi, and as we saw in Rotterdam two weeks ago, Fed does very well the match after a tough victory. If he is sharp right from the word "go" in the final, as he was in the Rotterdam final, he will have an outstanding chance to win.